"Acoma Village, Acoma Pueblo, NM," photograph, Lee Marmon Pictorial Collection (2000-017-B15-F03-1). Center for Southwest Research, University Libraries, University of New Mexico. 1976 Acoma: Pueblo in the Sky. Albuquerque: University of New Mexico Press. 1994 The Pueblo of Acoma. Charlottesville: University of Virginia Library. 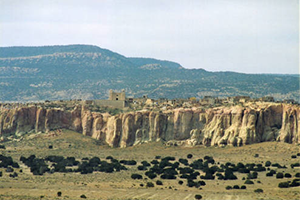 1997 Phoenix on the Mesa : Acoma Pueblo during the Spanish Colonial Period, 1500-1821. Ph.D. dissertation, Oklahoma State University.